The offensive will be spread over the next five years. A special forces school, a special forces unit and an army brigade HQ will be set up near Bilaspur. The Bde HQ will participate in anti-Maoist ops in the future. The army is looking for 1,800 acres of land to set up the infrastructure. Home Ministry is sitting on a plan to redeploy the Rashtriya Rifles [from Kashmir to the Naxal affected areas]. RR and BSF unlike other paramilitary forces, have heavy weaponry like medium-range machine guns, mortars and rocket launchers. For now, 27 battalions of the Border Security Force and the Indo-Tibetan Border Police will be moved into Chhattisgarh, Orissa and Maharashtra. The paramilitary forces will be supported by six Mi-17 IAF choppers. The helicopters will have on board the IAF's special force, the GARUDS, to secure the chopper and conduct combat search and rescue operations. The offensive will be in seven phases. Each phase has been marked area-wise as Operating Areas (OAs). 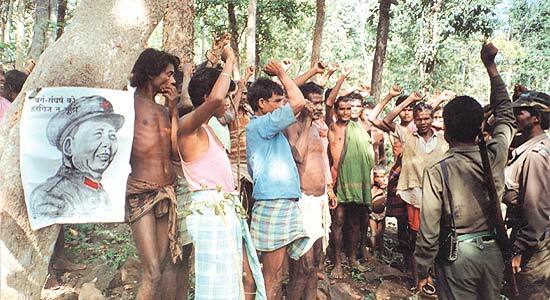 Vanwasi Chetana Ashram, a voluntary organisation based on Gandhian ideas and principles, was demolished in May 2009 by security forces, in the name of fighting Maoists. The offensive will be in seven phases. Each phase has been marked areawise as Operating Areas (OAs). The deep scars on constable Anup Sethi (name changed) are still visible to those who care to see. A year ago, while on an undercover mission in Dantewada, one of the worst-affected districts of Chhattisgarh, Sethi was caught by the Maoists, his AK-47 snatched away and his face and arms slashed with knives. He was allowed to live, since he was once a Naxalite. Back in uniform now, Sethi regrets the loss of his AK-47, but has now opted for something the Indian army discarded a decade ago: the older 7.62 mm Self-Loading Rifle (SLR). “It shoots straighter and kills better,” he says, patrolling deep in the jungles of Dantewada on a sunny afternoon. 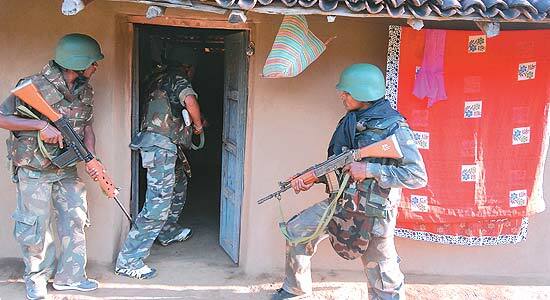 For years, the ragged security infrastructures in the Naxal-affected states of Chhattisgarh, Jharkhand, Orissa, Andhra Pradesh and Maharashtra have worked in isolation, pitting their motley crew of state police and central paramilitary forces againstMaoists—the whole thing was marked by an absence of strategy. The wheels might now begin to turn. Come November, and the Centre will mark the beginning of a coordinated, seven-phase offensive to take on Maoists in their core areas. For the first time, the ground is being laid for involving the Indian army and air force should the need arise, and strengthening existing state and paramilitary forces. For the first time ever in chhattisgarh, the army is setting up a brigade headquarters. With each part of the operation designated areawise as OAs or Operating Areas, the November Offensive will mark the first phase. A two-pronged attack, it will begin simultaneously in the Kanker district of Chhattisgarh and Gadchiroli in Maharashtra, together characterised as OA1. The objective is to proceed on a north-to-south axis from Kanker and a west-to-east axis from Gadchiroli, and meet at the 6,000 sq km swathe of forest called the Abuj Marh, which is “unknown jungle” in the local Gondi dialect of the tribals (see map). Indeed, the Marh is an impenetrable forest that has not even been mapped for revenue records and has therefore served as a major training and logistics base for the Maoists for years. 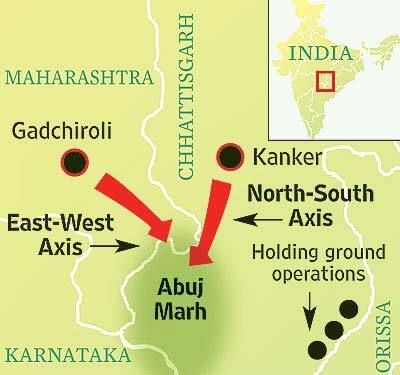 The strategy now is to push ahead, hit Abuj Marh and then hold ground. OA1 secured, it’ll serve as a logistics base for the next phase of operations—OA2—to be conducted in the Maoist-affected districts of Dantewada, Narayanpur, Bijapur and Bastar. Orissa’s bordering districts won’t conduct any offensive operations, with troops being deployed only in a defensive posture to hold ground and prevent Maoists fleeing Chhattisgarh from entering the forests there. Preparations have been under way for a while. As a major step, however, the Cabinet Committee on Security (CCS) cleared a pending proposal of the army headquarters to set up a special forces school, a special forces unit and a brigade HQ in Chhattisgarh. “The army wanted 1,800 acres of land, and we identified Bilaspur as the area for setting up the brigade headquarters,” Vishwa Ranjan, the director-general of police, Chhattisgarh, told Outlook. “As of now, Indian army officials are scouting around for contiguous land and the district collector has been instructed to help them set up the headquarters.” Bilaspur is Chhattisgarh’s third-largest city, and also the headquarters of the South Central Railway. With this, the army will be set to play a role beyond its present responsibility of training paramilitary forces like the Border Security Force (BSF) and Indo-Tibetan Border Police (ITBP). The Indian air force too will, for the first time, have a task cut out for it in anti-Maoist operations. Six Russian Mi-17 helicopters have been earmarked to aid the paramilitary forces on ground. Two each will be placed in Nagpur in Maharashtra, Orissa and Jagdalpur, the district headquarters of Bastar, to aid troops in conducting operations in inaccessible areas as well as casualty evacuation. The choppers will also carry the IAF’s special forces—the Garuds—to secure the aircraft and conduct combat search and rescue operations. According to sources in the air headquarters, the CCS also agreed that the air force choppers will have the permission to fire back in self-defence. Besides, the Centre and states are planning to send in nearly 27 battalions (of 800 to 1,000 men each) of the BSF and ITBP into Chhattisgarh, Orissa and Maharashtra to augment existing troops. The MHA is also sitting on a plan to redeploy the elite Rashtriya Rifles in the area once the brigade HQ is set up. A specialised force raised by the army to combat insurgency in Kashmir, RR will be diverted from Jammu & Kashmir “once the situation is more stable in Kashmir”, a senior official of the Union ministry of home affairs told Outlook. The BSF and RR, unlike other paramilitary forces, have heavy weaponry like medium-range machine guns, mortars and rocket launchers. This will take the new offensive to an altogether different level. The idea is that if J&K stabilises, rashtriya rifles can be freed for deployment in the areas held by maoists. After Ranjan took over, training methods were changed, fresh forces raised and new equipment brought in. Serving and retired Indian army personnel were brought in to train the Chhattisgarh police and reorient them in jungle strategy and warfare, battlecraft and special operations. The idea was to give the men the confidence to take on the Maoists and raise a force like Andhra’s Greyhounds, a specialised police force that operated in the jungles bordering Chhattisgarh and Orissa tracking Maoists. Earlier, the state had set up a counter-terrorism and jungle warfare school in Kanker district in 2005, and put it under the charge of Brig B.K. 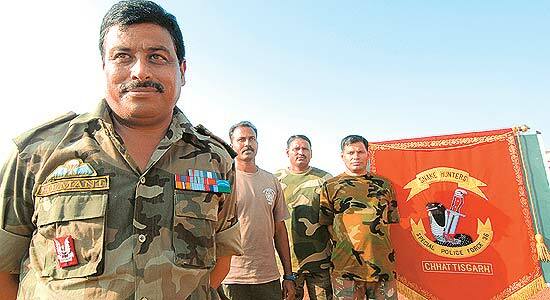 Ponwar, a retired commandant of the army’s jungle warfare school. Serving jcos from the army now impart training to all Chhattisgarh police personnel at the school. “Training in the school is now mandatory for all officers and men of the Chhattisgarh police,” says DGP Ranjan. The Chhattisgarh police in turn has set up a new school to train the men and officers of the Special Task Force men under a former Special Forces officer, Col R. Sharma. The infusion of the army’s platoon- and company-level tactics has already begun to pay dividends. The police now conduct surgical operations, living off the land in dense forest for weeks chasing Maoist ‘dalams’ and local guerrilla squads who have their own doctrines, strategies and training (see box). Will this strategy work? Hitherto, the government had neither any strategy nor the will to counter the problem. The MHA, the nodal agency for all internal security issues, did have a Maoist management division, but it was staffed with bureaucrats who had never served in Maoist-affected states or had any experience in counter-insurgency. The police bore the brunt of the Maoist attacks, yet weren’t included at the policymaking level to be able to make a meaningful contribution. With things drifting thus, police casualties had begun to mount in the recent past, compounded as their woes were by lack of adequate training and equipment. The deployment of the Central Reserve Police Force proved to be another disaster. Ill-equipped and ill-trained for the job, many of its personnel lost their lives in mines and IEDs laid on village roads by the Maoists. Understandably, the CRPF panicked and restricted its men from operating beyond a radius of 5 km beyond their camps, which has now been revised to a radius of 8 km. Things began to change and an anti-Maoist strategy began to take shape once P. Chidambaram took charge as the new minister of home affairs post-26/11. To begin with, a serving brigadier of the Indian army was brought into the MHA to formulate strategies, while a police officer was posted as a joint secretary in the anti-Maoist division. Serious deliberations thereon have culminated in the November offensive. The MHA intends to start development works in areas that are cleared and secured. But as the build-up for the offensive begins, police in the area is getting rapidly militarised and the scars of a protracted conflict have begun to appear on civil society. Are Orissa, Chhattisgarh, Jharkhand and Maharashtra headed the Manipur or Kashmir way? Will the recent spate of violence by the Maoists evoke a more lethal response from a state digging in its heels for a long war? Many more shades of grey might invade the frame gradually as the battle for the soul and the very idea of India enters a decisive phase.